Are you intentional about creating a joyful family, or are you just waiting for it to happen? JoDee Curtis, SHRM-SCP, CPA, and Denise McGonigal, MA, challenge you to choose joy for yourself and your loved ones. Find out how to create a more positive family life by focusing on each member’s strengths instead of fixating on their weaknesses. The JoyPowered™ Family helps families (biological or self-defined) understand how focusing on strengths can bring out the best in others and themselves. Joy can start with one family member at a time; it starts with YOU, wherever you are. 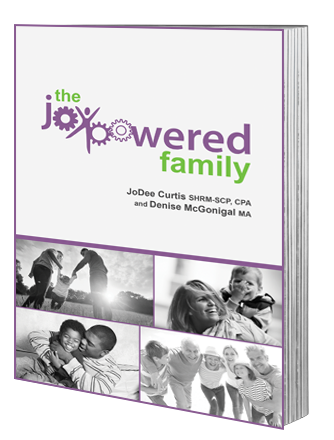 The eBook version of The JoyPowered™ Family can be purchased for $4.99 via Amazon. You can buy a full print copy of The JoyPowered™ Family for $12.99 plus tax. Click the "Buy Now" button below!